A psychic who can read minds picks up the thoughts of a murderer in the audience and soon becomes a victim. An English pianist gets involved in solving the murders, but finds many of his avenues of inquiry cut off by new murders, and he begins to wonder how the murderer can track his movements so closely. Contains violence and gore. Finally got a chance to see this movie after falling asleep on it more than twice magnificent. I am rethinking the Giallo slasher genre as my favorite horror art style now. Thank you Shudder keep it coming. 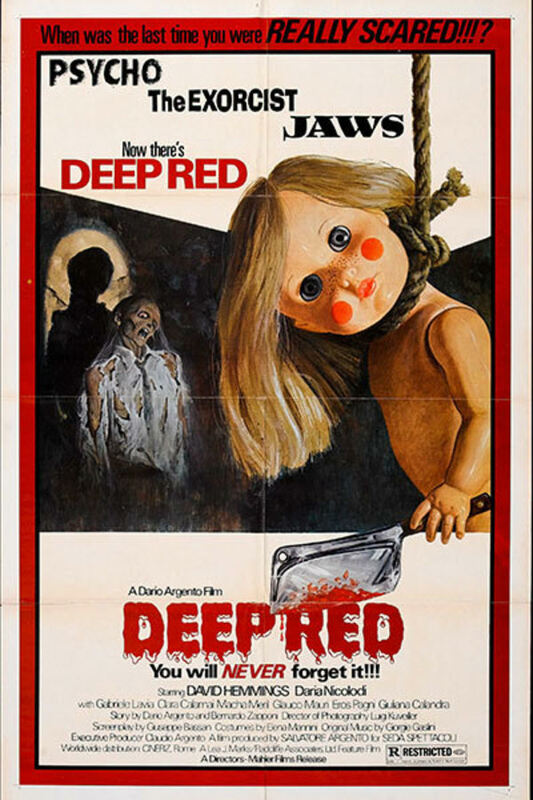 Wow, after all these years putting off watching Deep Red it turns out to be my favorite Argento! Super happy when I can still get this thrill of discovery. I found the whole style from lighting, camera moves/composition and editing to be a complete pleasure. The Goblin score is so good! For whatever reason I came into this movie completely in the dark so my experience with it was pretty pure. Fun giallo story too. The deaths (especially at the end) were marvelous and best characters in an Argento movie for me. Every pianist needs this level of commitment. I really like this version of the movie, but I would love for the original cut. Taking out all the humor is strange as well as taking all the scenes establishing a relationship with the two main characters. And getting rid of the most violent scene hurts too. One of Dario Argento's best in the giallo genre. A stylish murder mystery with vivid cinematography, set pieces and some truly graphic murder scenes. Many American horror films were influenced from this film.